from Nanaimo, B.C. to Victoria, B.C. 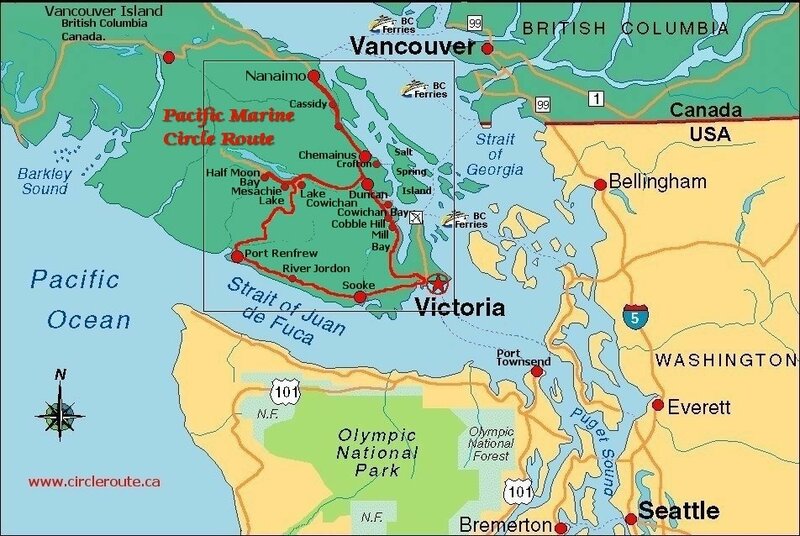 The Pacific Marine Circle Route extends from Nanaimo, Vancouver Island, B.C. to Victoria, B.C. north westerly to Port Renfrew and easterly to Lake Cowichan and on to Duncan where it joins up withhighway 1, where you could drive north again towards the BC ferry terminals in Nanaimo. The route averages 250km and can be divided up into smaller legs providing overnight stays between two and four days depending on your schedule. The route brags world class cottage wineries, a town full of murals, another full of native totem poles, numerous smaller circle tours off the beaten track, and many historical trails and sites of interest. The Pacific Marine Circle Route will excite the most enthusiastic traveler with the cultural diversity of Vancouver Island. It is full of Victorian architecture, wild first growth forests, hiking trails, trophy salmon and halibut fishing, or just a gentle kayak or canoe cruise up some remote estuary or inland eco reserve. Vacation land is here like you have never seen before! Location: Sooke Region Museum is a 40-minute drive from downtown Victoria, via Highway 14, also known as the Pacific Marine Circle Route, where you will find the museum with its lighthouse and information center, immediately past the Sooke River Bridge. with the exception of Mondays during the winter season and a brief Christmas closing. Location: The BC Forest Discovery Centre is located off the #1 highway in Duncan, B.C., Canada, one hour north of Victoria, B.C. on Vancouver Island. Summer hours: 10:00 a.m. - 5:00 p.m. Empress Hotel in downtown Victoria. Open 7 days a week from 9 a.m. to 5 p.m.